Late last year, we unveiled a new tool for increasing sales through your Webstore. The Webstore Broadcaster allows you to publish your Webstore listings on Google Shopping without an in-depth understanding of Google’s advertising platform. From account management to advertising optimization, we’ll create and manage top-quality product feeds on your behalf. How do we do this? By using the ecommerce conversion data collected from the millions of Bonanza sales made via Google Shopping. Why open a Webstore? No selling fees, free listings, and the freedom to build your own online brand, among other reasons – learn more. Our goal in creating the Webstore Broadcaster was to increase Webstore traffic, reduce the busywork that comes with operating a standalone website, and help entrepreneurs build their brands. 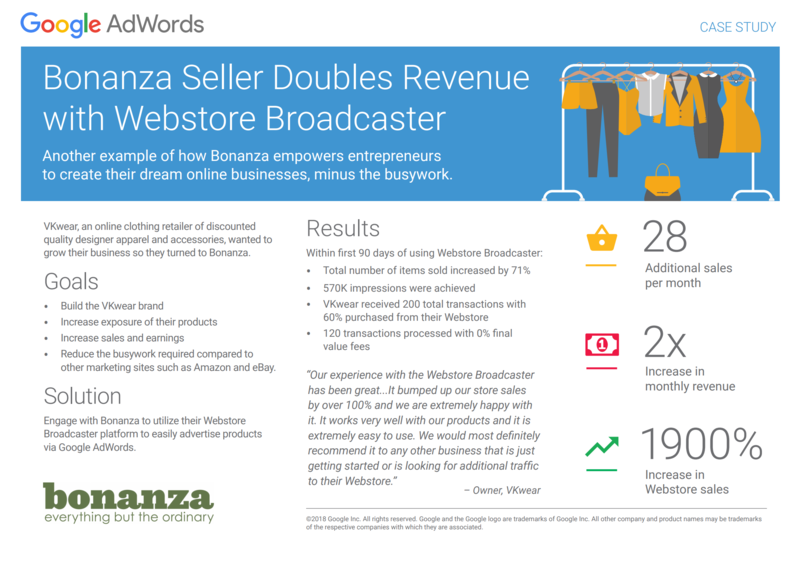 The Webstore Broadcaster works for sellers, but don’t just take our word for it. Hear from this successful seller about his Webstore Broadcaster experience. Vasil signed up for the Webstore Broadcaster to take advantage of our signup perks and assess if the tool would work for his business. Hang on a second. Signup perks? Like what? Okay, back to Vasil. Within the first 90 days of using the Webstore Broadcaster, VKwear’s total items sold count increased by 71 percent and his items received over half a million views. Of VKwear’s 200 total transactions during that time period, 60 percent of them came from the Webstore. That’s 120 transactions processed with 0% final value fees. For more information about this case study, check out the infographic below! Like all of our tools and features, we built The Webstore Broadcaster to help sellers succeed. There are so many intricate details that go into running an online business, and we hope to make navigating the ecommerce waters a bit easier. Level up with the Webstore Broadcaster. Get started today. Still have questions? Contact our support team – they'll be able to help you out. Bonanza is responsible for providing the service aligned to this offer, including sourcing and entering the Google AdWords code on your behalf as specified below. Bonanza terms & conditions apply, please visit our Help Center for complete details and restrictions. In the below terms, “AdWords” may mean AdWords or AdWords Express, as appropriate. 1. Offer available to customers with a billing address in the United States only. One promotional code per advertiser. 2. To activate this offer: Enter the promotional code in your account before August 7, 2018. In order to participate in this offer, you must enter the code within 14 days of your first ad impression being served from your first AdWords account. 3. To earn the credit: After entering the code, your advertising campaigns must accrue costs of at least $25, excluding any taxes, within 30 days. Making a payment of $25 is not sufficient. The tracking of advertising costs towards $25 begins after you've entered the code. 4. Once 2 & 3 are completed, the credit will typically be applied within 5 days to the Billing Summary of your account. 5. Credits apply to future advertising costs only. Credits cannot be applied to costs accrued before the code was entered. 6. You won’t receive a notification once your credit is used up and any additional advertising costs will be charged to your form of payment. If you don’t want to continue advertising, you can pause or delete your campaigns at any time. 7. Your account must be successfully billed by AdWords and remain in good standing in order to qualify for the promotional credit.